After a traumatic car accident, Luke Rendel returns home from college, trying to escape survivor’s guilt and piece his life together. 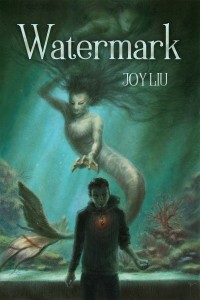 But when he takes a job as the night guard at the town aquarium, he meets an enigmatic, mermaid-like creature named Urhoa trapped in a tank who claims that his grandfather owed her a debt–and it’s time for Luke to pay. As Luke searches for the pearl, mirror, and comb that will free her, he discovers that their worlds are more intertwined than he could have imagined. He must use what he learns to face monsters of the ocean and his inner demons, and keep his wits about him, for not everything is what it seems. When I went on a class field trip to a sleepover at the Tampa Aquarium in the 12th grade, I didn’t expect to find inspiration for a novel. But waking up to a scene of pink coral and butterfly fish, I wondered, how can they possibly account for all the fish that are in this tank?…What if there was a creature in the tank that they didn’t know about? I had a vision of a mermaid peeking out from behind the rocks. Nine years later, Watermark is the result. The characters arrived naturally. Although Luke is the narrator and protagonist, the central conflict, for me, were the characters of Urhoa and Ihle. Urhoa is pensive, and a bit on the conservative side. She wants to abide by the laws, but does reprehensible things in self-interest. Ihle, on the other hand, was always caught between two worlds, and never felt like she belonged to either, so wanted to make a world for herself and the others like her, laws be damned. I kept on looking at the mark on my arm. I had cherished it as my special bond to Grandpa after he disappeared. Guess he’d fooled me. I inhaled deeply. I didn’t understand how he lied so easily to my face. I searched my memories, trying to remember if there was ever a subtle double meaning to his words, if his tone had been off, a facial expression that seemed strained. I couldn’t think of anything. He had been the perfect grandfather. It was part of the illusion he built me. I exhaled. I had to ask myself the question: what if his disappearance wasn’t accidental? What if he’d “disappeared” so he would be free of the burden he’d brought upon himself? It was terrible to think that. He wanted nothing but the best for me…And I was back to where I started, my mind wandering in widening circles of confusion and despair. Why me? Why now? No matter what it took to get the answers, I had to know. When I reached the aquarium, I marched straight to the coral reef tank. I banged on the glass. “Don’t you know you’re not supposed to tap the glass?” Her hair rose over the rocks first, then her face, and the rest of her body followed in one smooth flick. It’s traumatizing for the poor little fish. “You know what’s traumatizing? Almost getting eaten by a killer whale,” I said into the conch. “You received my sign,” she said with delight. “My friend was out there with me. Whatever you do, it has to stay between you and me,” I said. A giggle leaked from the conch. Not a satisfying answer. “What do I have to do?” I said. “Fine. Fakahr div chae,” I repeated. “I will become the hunter. To be used for whatever purpose she deems fit. Should I complete my task, may the ocean see that I am released from my bond. I turned it upside down, and yelped as water came out of the conch and splashed my hair and clothes. The shell cracked and shattered into pieces that scattered on the carpet. Water dripped into my eyes but I kept staring at her. She stared back. The silence spanned several seconds. Then a sharp pain worse than any I’d felt before jolted through my left arm, making me double over. “What the hell?” I yelled. My hand spasmed and my fingers twitched uncontrollably.